I first came across this Sheffield based British band thanks to the release of their 4th full-length album We Were Exploding Anyway (for which a review, including a lengthy history-of-the-band, by yours truly was posted on 17/05/2010 – find it in the website's “Archive” section to satisfy your detail-seeking curiosity), bombarded the album into my year-lists, and even went out to the local record store to get a vinyl copy of the album (which has remained un-opened in its cellophane wrapping to date), and vowed a solemn oath to follow up on the band, even get myself its older material! I'm afraid good intentions doe not make a true fan out of me, because with increased activities for the website, an increased activity in my paleontological endeavors, and the closing of my favourite shop, I have indeed not been buying very many new albums since. Here at ConcreteWeb HQ, we even missed out completely on the release of the band's 5th studio album...oh wait, first let's update the info from that review, mentioned above, okay? (info taken/ re-written in part from the band's Wikipedia page) First of all, I found out what the individual members do in the band, at least on the new album, so here it is : Joe Shrewsbury plays guitars, as does Paul Wolinski, whom however also puts in piano and additional programming. Simon Wright is the band's bassist, but he also delivers synth embellishments, and finally, Robert Jones plays all drums. Now, let's warp back in time, to just after the release of the 2010 album, which the band promoted by quite extensive tour which got the band throughout the UK, Europe, and also saw 'em play shows in Russia and Japan, that same year. The band also played a 5-day residency at Edinburgh Fringe, and found a track of theirs used in a BBC trailer campaign. Also that same year came the release of the Heavy Sky EP (made available to pre-order in different packages), consisting of songs from the Exploding sessions which had not made the album, and an edit of the track “Tiger Girl”. The Japanese version of the EP (released in January 2011) of course had some bonus tracks (alternate versions of two tracks, plus a completely new one). Fans in Australia, who hadn't bought either the album ór EP, were the lucky ones, when halfway 2011 a deluxe version of the album and EP (featuring two additional exclusive tracks, and a new remix of “Tiger Girl”, done by Aussie instrumental band sleepmakeswaves) was issued through Bird's Rope Records. Gigwize, the band finished touring Japan, then went to Taiwan and Singapore, and again put in dates in Russia. In July 2011, the band announced its intent to fund a studio recording of the Silent Running soundtrack (based on the 1972 movie, they had already performed their score at May's Sensoria Music & Film Festival) by raising $7,500 through the crowd-funding website Indie Gogo, and found at the end of the funding period that they had actually raised over $27,000! They performed their version of the soundtrack at the two-night Glasgow Film Festival to phenomenal success, and consequently performed the score on a European tour. The soundtrack was released in mid-November as a numbered and limited edition vinyl LP to those Indie Gogo funders whom had paid for that option, and as a digital download from the band's website (which explains, I guess, why ConcreteWeb was left out of the loop?). Meanwhile, Wolinski releases his debut album Labyrinths with his side-project Polinski, and tours the material worldwide. 65 music is used in several trailers and TV spots, and the track “Radio Protector” is given to a huge ad campaign by Oxfam. Also, the band works with scientist and BBC correspondent Adam Rutherford on a project with Nasa, for the Uncaged Monkeys live tour. The first part of 2012 the band is again on tour, playing shows in Greece, Turkey, and continental Europe, before heading out to several Summer festivals (those including headline performances at the British 2000 Trees and Tramlines festivals, Belgium's Dunk!, Croatia's Terraneo, and the Astral Festival in Russia & Ukraine). Along the way, Bird's Robe Records releases the band's back catalog for Australian distribution. Toward the end of the year, the band gets a price in the 'Hardest Working Band' category at the 2012 AIM awards. Eventually, the band performs its Uncaged Monkeys project at London's Hammersmith Apollo! And 2013 started with the band's first ever tour of Australia. Additional dates were played in Malaysia, Kuala Lumpur, Hong Kong, and China, as well as (again) in Taiwan. During Summer, the band also played the prestigious Glastonbury festival for the first time. In other words...these guys have come a long way, indeed! The foundations for the band's 5th official album were apparently laid down as far back as 2011 but, according to the info sheet which came along with the download copy of the album, the band did not leave the material as such. Nay, instead they started to deconstruct the music, and as a result the 8 tracks (which have a total length of just over 50 minutes' playing time) on Wild Light sound perhaps more movie-soundtrackish than any album they've ever released. Moments of solo piano will be alternated against bombastic guitar & bass walls, infused with nicely intricate but still superbly melodic synth passages. Some tracks will be overall calmer, but still contain somewhat heftier passages, while other tracks will be overall heavier, bu not devoid of calmer insertions. In essence, as with previous 65dos albums, but perhaps even more so this time, Wild Light is one of those albums which will provide the more seasoned music lover with a record which (s)he can listen to several times before getting the complete picture...an album which (s)he can continue to play as extensively in a month's time from now, because that's how great the album is. Put quite pure and simple, 65dos are the ultimate continuation of the very best acts in the experimental guitar/ synth genre which started in the '90s! In the “Music” section of the band's own (www.) 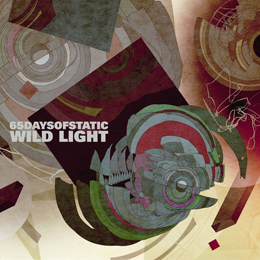 65daysofstatic.com, you will find the new album's “Prisms” (one of the overall “calmer” songs) alongside material from older releases and, although it doesn't give a complete picture of the album's diversity, it is nevertheless still representative. An edited version of the same track can be found at (www.) facebook.com/65daysofstatic, as well as the first tour dates for the upcoming year (let me take this opportunity at hand to relate the fact that the guys just finished a US tour during the month of November as well). I guess anyone wanting to hear more samples of the album would have to make due with the 30-second samples usually provided by the trusted online sales sites...but quite frankly, after having heard what's posted on the band's own website, you should've already made up your minds, put on your coats, and ran out of the house to go get the album at your local record store(s). Of course, alternately, you might go for a (paid) download, but you would be missing out on the album's booklet and cover artwork, wouldn't you? Ach...yet another addition to those year-lists of mine, I ecstatically state with a sigh... Oh, before I forget: the iTunes download will provide the exclusive track “Doxxx Yrself”, and the limited edition of the physical album will have the exclusive track “Destructivist” as a bonus!